Town planning is a specialised skill. It is required in designing settlements from the smallest towns to the largest cities. Sri Lanka’s town planning history dates back to the 3rd century BC when King Pandukabhaya established the nation’s first city Anuradhapura in the North Central Province. The evolution of the island’s city planning principles can be traced to the British colonial period with the invention of railways, the automobile and aircraft posing new challenges to town and city planners worldwide. In this country, the rapid expansion of motorised transport in parallel with urbanisation created problems that have worsened in the post-independence era. A lack of foresight, ad hoc solutions and unwarranted political interference are to blame for this. Following 1948, several regional and master plans were introduced, beginning with Sir Patrick Abercrombie’s regional plan for developing metropolitan Colombo and surrounding areas. But how effectively successive governments and town planners implemented these plans, considering the vehicular traffic, slums, high-rise buildings, pollution and health hazards – all of which urban dwellers have experienced in the past several decades – is in question. Colombo’s high population density not only creates transport and other infrastructure issues but many socioeconomic problems too. Traffic congestion in urban areas has become a virtual nightmare, and causes economic losses to both the state and private sectors. Despite the construction of expressways, our road network is not geared to meet the increasing volume of traffic in towns and cities. In a TV interview, a motorist who had travelled 94 kilometres on the Southern Expressway from Pinnaduwa in Galle to Kottawa in less than an hour said it took him nearly two hours to reach the city of Colombo from Kottawa! A major threat to proper town planning is the encroachment on available state land that includes environmentally sensitive areas. The informal sector has been encroaching rapidly on public spaces in all conceivable urban areas and become a headache for municipal administrators. Some construction, though supposedly legal, raises questions as to how permission was obtained for them, violating all norms of town planning. The public should be empowered to demand answers to these questions. One example is the Mount Lavinia junction in the island’s second-largest municipality. Until the late 1970s, it had a CTB bus terminus and small market building. Today, the space meant for the bus terminus is occupied by a high-rise building that is under construction. There is virtually no space for parking CTB buses that begin or end their scheduled routes in Mount Lavinia. The area meant for parking private buses is hardly adequate, and obstructs the movement of other vehicles and pedestrians. The large supermarket market building that replaced the old one around 1980 is an eyesore. Within the same municipal area, the flyover at Dehiwela junction hasn’t reduced traffic congestion with heavy vehicles including buses not being allowed on it unlike the one in Nugegoda. In other words, there is no coordination between the responsible authorities. 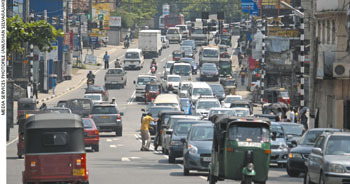 In February last year, the Chief Minister of the Central Province criticised the Ceylon Electricity Board (CEB) for being a stumbling block to resolving the severe traffic congestion that had become the bane of Kandy. He charged that the CEB had not taken action to reposition electricity supply pylons that were obstructing the smooth flow of traffic. According to Moratuwa University’s transport and logistics management expert Professor Amal Kumarage, a bus rapid transit (BRT) could be established fairly soon and at a much lower cost to address the gridlock in Colombo. A light rail transit system circling the city too will reduce urban traffic congestion and wastage of man hours. Modern light rail technology has proved to be flexible and adaptable for this purpose. In cities such as Hong Kong, railways are the key to reducing traffic congestion. Kumarage stresses the need to implement a pro-public transport policy as road widening and constructing expressways, elevated highways and flyovers, and one-way traffic schemes, will not provide adequate solutions to urban traffic congestion. Proper town and city planning is linked to a wide range of requirements that involve economics, ecology, sociology, geography, legal measures, land use, transportation and curbing pollution, all of which must be balanced to reach the desired goal. The recent construction of buildings depict an overpowering nature. This is one reason that main roads are forced to be congested and narrowed. Property development is rapidly increasing and boundaries of buildings come up to the main roads. As a passer-by, you will notice that high rise commercial buildings and apartments with their decorative plant beds are almost on pavements; the buildings seems to run short of parking and front spaces within their territories. Though it is the regulation in many countries to have adequate parking and recreational space, in Sri Lanka it does not seem to be a serious concern. Therefore, any shortfall would have to be shouldered by the sidewalks and pavements of the main roads. Many of these buildings are constructed under big companies and are situated facing main roads under A category. These main roads may be subject to be widened as well. It is rationale to raise the question as to how these street lines will be accommodated after a few decades. Jammed development? Handling encroachment has become a painful affair for municipal administrators. Why? It’s because their own heads and people with higher authority entertain personal favours from residents for encroachment, while giving orders to staff below to carry out the rule on same. The receiving end not serving the purpose is the very cause for this menace. This way, residents extend their property space by easily encroaching side roads and lanes. So many lamp posts are made to stand on the road itself, which makes the roads narrow. Not even two vehicles can pass and walkers have no ground left to walk. This also disrupts the movement of vehicles that detour off main roads in traffic hours. The situation is worse at T-junctions in such lanes, as this is where traffic piles up. Even school vans and coaches bypass main roads and take these routes, further disrupting pedestrians and other vehicles. There are many encroachments in marshy lands that often go unreported and undetected. Also authorities patronise encroachment of railway reservations in the form of slums, where even drug dealing takes place, and even provide them with water and electricity connections, provided that they are potential voters. All these take place because those who make the rules break them and thus, all complaints fall on deaf ears. In ancient villages, houses, paddy fields and tanks were located according to a logical and meaningful basis. In this traditional backdrop, village planning had its own experts who were initiators, residents as well as beneficiaries – they had a better understanding of the geography and livelihood. Such villages were rich in technically significant elements that are linked to city development. Town planning includes pre, during and post project management. The weightage may vary from each phase and project. There cannot be generalisations from a particular project to another. Sometimes a major portion cannot be planned until ground work has been carried out. Productivity, objectives and outcome are also attributable to sound project management. Vehicle traffic is a crucial issue in the development of cities, which has been effectively dealt with the solution of public transport in Asian countries. It is a known fact that people in cities are civilised and fear punishment and strict rules. In many South Asian countries, people resort to public transport which also provides affordable travelling. Such services are regulated and are under strict surveillance. Such light rails are comfortable, clean and are not allowed to be overcrowded. If light rail is to take off in Sri Lanka, there cannot be any uncertainties with regard to safety for women and school children to travel alone. Accordingly, the perception of people towards improved public transport over private cars, should be in a positive light. There are social status issues where people have virtual barriers in their minds that travelling in common transport modes like rail is for certain classes of people or workers. People too need to break such narrow-minded barriers and see the common benefits for the economy at large, in making a city for better living. The public and the Government need to be dutiful and work harmoniously for successful and sustainable town planning and development. A house, an office, a workshop in a row, a factory in a residential neighbourhood – randomly located – that is how we see scattered placements of buildings and areas in cities in Sri Lanka. It indicates that planning authorities give little weightage to interconnected components (such as ecology and land use) and do not seem to consider the flow of traffic, movement of people and their necessities when reasoning what buildings should be located where and why. This building from Mt. Lavinia is a classic example to talk about the primitive nature of our local town planning. It is like a sky rocketed town plan that in a highly populace suburb, is suddenly housing an ayurveda spa in the middle of the town next to the supermarket. At the same time, customer appeal on this spa, which is located in a busy and noisy location, is questionable since it is supposed to give healing in a relaxed and calm environment. Similar circumstances can be observed where schools and educational institutions are permitted in residential areas. Due to disturbances, noise and lanes being blocked by traffic and students, many residents are compelled to move from their preferred neighbourhoods. An emergency in a peak time is a worst case scenario. Where does development stand then?